Returning to Stonehenge VR… to play in a sandbox? As an ancient monument, you cannot even approach Stonehenge in real life – but with Stonehenge VR you can get up close and personal. Now with the SANDBOX update, you can do things you probably never imagined with the ancient stones. We caught up with Christian Bretz of VoyagerVR to see how things had progressed since their launch, and talk SANDBOX. Tell us a bit about your development background – Stonehenge VR was your first VR project. Was it also your first software project, period? A big part of our story is that I wanted to start a VR company, but couldn’t find the financing to hire developers, so I taught myself how to create VR software in Unreal in three months. There is one other piece of that story that we don’t normally get to talk about. When I was in high school I used to create mods for Quake II, and at one point I created a mod called Virtual Reality High School and submitted it to the school science fair. The concept was that kids new to the school could take a virtual tour of the campus. We photographed the principal and teachers and replaced all the player models from the game, so when you would walk up to the library, the principal would pop up in front of you and give you a brief description of that location at the school. You would think this would have won a high school science fair… but no it didn’t, because there was a bug in the software, a pretty big one. I forgot to set the trigger to only spawn the principal once, so if you stood on top of the trigger, the principal would continue to respawn; because this was made in the Quake II game engine, he would “telefrag” himself and body parts and blood would explode everywhere, over and over. This happened while we were demoing to the judges at the science fair… and that was the end of my software development career, that is until the resurgence of the VR we see now! Moving on from that ill-fated science fair, what’s happened with Stonehenge VR that’s a bit more positive? 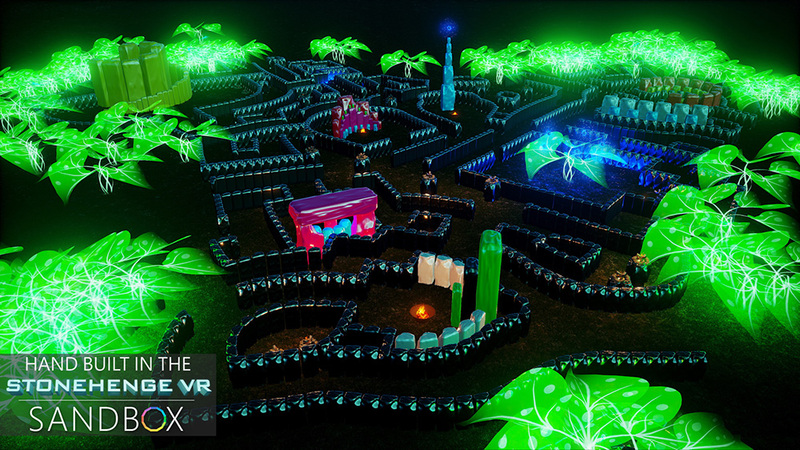 One of the big ones last year was being a part of the Viveport launch. 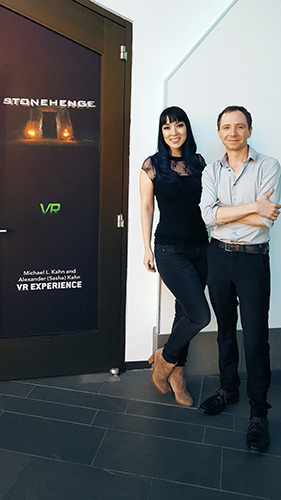 Having the support of Jenna Seiden and everyone on the Viveport team was so important to us in the early days of what we were doing, and it really helped validate what we were doing. We installed a museum exhibit at the Pacific Science Center in Seattle for a short run over the summer last year, and then installed a second permanent exhibit at the Museum at Prairiefire in Overland Park, Kansas. Museums are difficult to break into and we were even told that by the various people we’ve worked with. I remember one phone call where a museum administrator said “You know Christian, we don’t normally allow anyone to just do this.” Implying museums aren’t in the habit of creating exhibits out of something someone made in their bedroom. That whole experience has been probably the most rewarding thing I’ve ever done to this point, and I have to give a huge credit to the Unreal Engine and the HTC Vive for all of these opportunities. The power of both of these pieces of technology has allowed all of this, and we couldn’t be more grateful they were both available to us at the right time. We also did a college lecture for the design students at Cal State Long Beach which I loved doing. 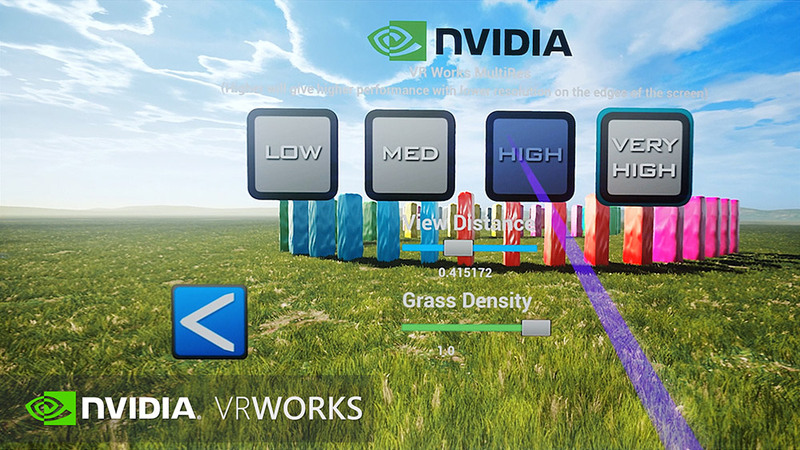 Now, we just launched the 2.0 version of Stonehenge VR with the addition of the new SANDBOX mode, so we’re excited to see the response! You must have shown off Stonehenge a lot since launch. Can you tell us about any special moments you witnessed? One that comes to mind is the first time I ever showed the SANDBOX mode to someone. I had been working away for about a month, and had no intention of showing anyone at this point because it was so early on. My business partner Jessica hadn’t even seen it yet. I was a bit concerned because I hadn’t really planned on giving a demo, and I’d never made anything like this before so I had no idea what the reaction was going to be. He ended up spending over an hour playing it! Which in VR can be a pretty big deal. If someone doesn’t like it or it’s making them sick, they’ll just take the headset off or say something like “Are we done now?”. I was really happy he liked it and it gave me some signal that I was actually making something people could enjoy. Let’s get up to date! Sandbox mode. Tell us what it is, in a nutshell. Does it involve sand? Sorry to disappoint, but it doesn’t involve sand or boxes! 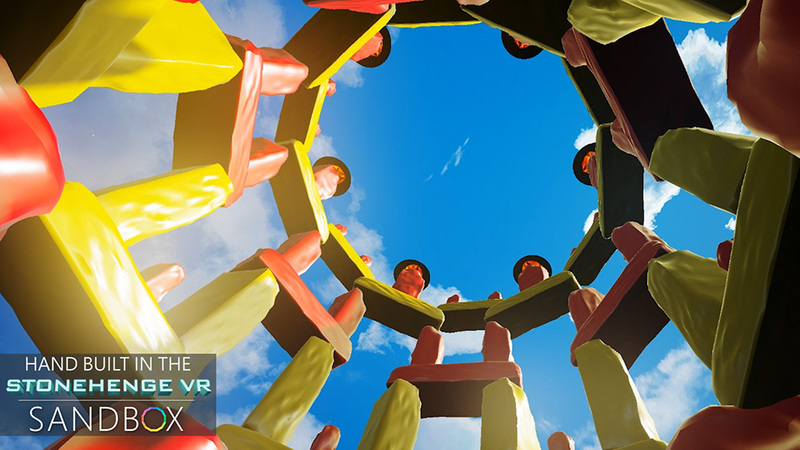 The Stonehenge VR SANDBOX mode is a physics based creation tool that allows a user to build their very own custom designed monuments by hand. We’ve also called this version of the software Stonehenge VR 2.0, but it jokingly has had a double meaning. It is version 2.0 of the software, but with the SANDBOX it’s like you’re creating a modern 2.0 version of the monument. One thing that surprised me as we were testing the software, is that you don’t have to be an experienced artist to create something compelling or beautiful. If you look at our trailer or screenshots you can see some of the examples of what’s been created in the SANDBOX. What exactly can you do in SANDBOX? Once you complete the Museum Mode Tour in Stonehenge VR, the SANDBOX is unlocked. When the SANDBOX mode is loaded, you’re standing back in the grassy field in front of the original Stonehenge monument. At this point you can choose to delete Stonehenge and start from scratch, or you can build on top of it. You can change the environment to a day or night setting. If you set the time to night we have various lighting effects you can add to the scene to create atmosphere, such as campfires and even some fantasy elements, like butterflies that light up the darkness. One of our favorite tools is the Paint Launcher which allows you to color the stones by shooting big globs of paint that fill the scene with color. Another cool tool is the ability to make yourself as small as an ant or as big as a building. The stones at Stonehenge can be over 9 meters tall, so we had to give people the ability to change sizes to move these giant structures around. Finally we have the music player that’s built into the controller. We noticed during testing that the SANDBOX was much more enjoyable to watch if some great music was being played at the same time. It comes with the whole soundtrack of Stonehenge VR built into the app, and you can also add your own custom MP3s to the playlist as well. There’s a bunch of other cool tools such as a hovercraft that you can control to traverse long distances, but those are some of the primary features. This whole thing actually all happened very organically. I definitely didn’t wake up one morning and say “I’ve got it! 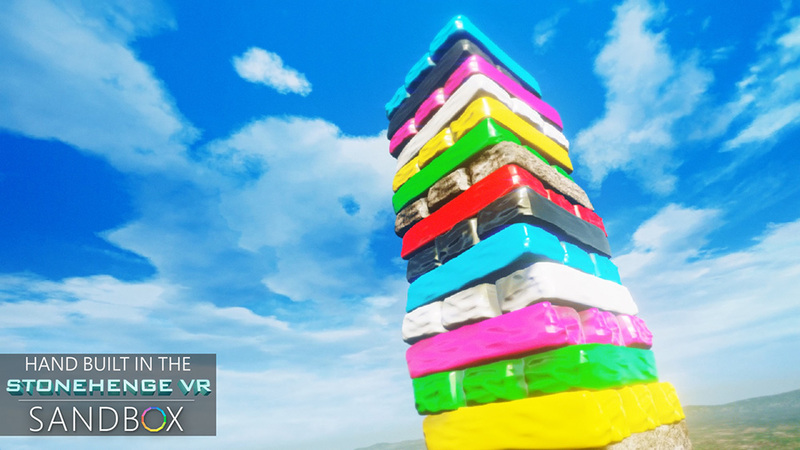 People want to stack stones in VR!” I can’t take credit for that flash of genius. It actually came as a result from a ton of feedback I received after watching people go through the original tour experience at the museums. There’s this part at the end of the original Stonehenge VR 1.0 experience where the credits come up, almost like they would in a movie theater. Just for fun, I added a table in front of the credits screen with a miniature version of Stonehenge for people to play with, in case they didn’t want to watch the credits. Some people would try to stack the rocks in a new formation to make their own structure, and some would get very destructive and knock the whole thing down. Either way, this was clearly a part where they would really start to smile. If their family was nearby in the same room watching them, they’d all be laughing and having a great time, or telling them what to build. In so many instances people’s comments can be spot on, this is one of the things I really love about developing VR software. The original concept was very simple, but once I got the basics of the app up and running where you could spawn stones and stack them I thought, if you can spawn them then you have to be able to delete them, and if you spend all this time building something there needs to be a save system, and that process went on for months. Your trailer shows a little party going on… are there any specific multiplayer functions in the Sandbox update? We’re really excited about how that trailer turned out. We had an amazing director of the live action portion, Chris Laxamana. He’s done promo videos for companies like Microsoft and Mashable, and we felt really fortunate to have him. We cast all our streamer friends like Jovenshire, Leo Camancho and Juliana Barriniger for the video, and Chole Dykstra did our voice over, which was all a whole lot of fun. There is no multiplayer yet, but it’s at the top of the list of things we would like to add in future updates. We chose the home/party setting because we wanted to emphasize the idea that this is a museum exhibit you can now have in your home, and it can be engaging to watch with a group. It can actually get pretty tense when you’re building something very high up, one wrong move and the whole thing comes crashing down. Development wise, what were the most valuable lessons you learned either from developing the ‘v1’ version of Stonehenge, or the new Sandbox mode? I think a big one is that 90% of the feedback when it comes to VR usually has some legitimacy. If they don’t get it or it’s not intuitive, you need to tweak it or change it. The Stonehenge VR SANDBOX you see now has gone through hundreds of tests and revisions, all based on feedback we’ve received. We have a policy of always moving forward. When I couldn’t get funding two years ago, I taught myself Unreal and made Stonehenge. Six months ago when we weren’t sure who our next partnership would be with, I started work on the SANDBOX. We always have many potential offers that all sound great, but you can’t wait for them to happen. I’ve never put a ton of effort into anything that didn’t ultimately pay off in some way. Now the Sandbox mode is done… what’s next? More monuments? Something else entirely? Right now we’re taking everything one day at a time. We want to ensure that the launch of the Stonehenge VR SANDBOX is a successful one, and that we can help answer any questions people have about it. While we think it’s currently a complete product, there are still so many cool features that we can add to it. We’re already working on the first update to the SANDBOX, which will incorporate Nvidia’s Ansel technology. It’s a great tool that will allow people to take really high res photos of what they make in the SANDBOX, but even cooler – export beautiful 360 stereoscopic photographs that can be viewed on mobile VR devices and 360 sharing sites like Facebook. Thanks for talking to us, Christian! Stonehenge VR – including the new SANDBOX update – is available on Viveport, and in Viveport Subscription.